Last year’s glass bowl container gardening experiment did not work out, but I refuse to consider it a failure. It was a learning experience: I have learned that I do not garden well with glass containers, no matter how nice they look on Pinterest. One thing that puzzles me was the stevia (sweet herb) plant–that I did NOT plant in a glass bowl, by the way. It was doing great until I plucked a few leaves to harvest and try. Then the leaves just started drying out and turning brown, until the whole plant died. Is this typical? Do you only get one harvest from a stevia plant? If so, why does nothing I’ve read about growing and harvesting stevia mention this? Getting to the present, with some local temps into the 70s and 80s already–followed by plunges into the 30s and 40s–I resisted temptation to dig in the soil no more, and have already started my new foray into growing my own food. Don’t you love the smell of fresh soil when you work it with your hands, even gloved hands? This time I’m using the same organic potting material I used last year, a beautiful terracotta bulb pot, and organic arugula seeds. 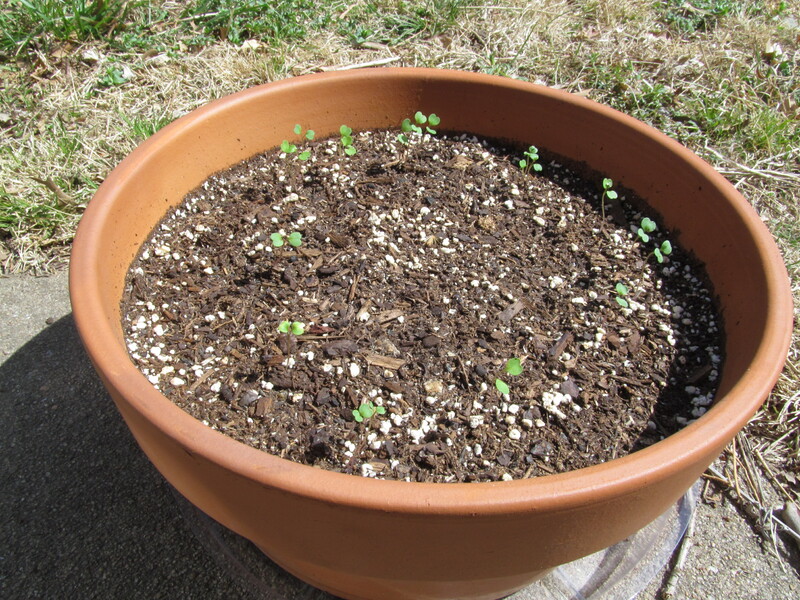 I’ll thin these sprouts soon, and in a couple weeks, I’ll probably plant a few more in the center of the pot, for a staggered harvest. I may be broke, but, by golly, I’ll have something I can eat!